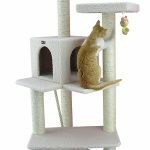 Cats love vertical structures to climb on, and this cat tree by Armarkat will give your cats plenty of height to scale. 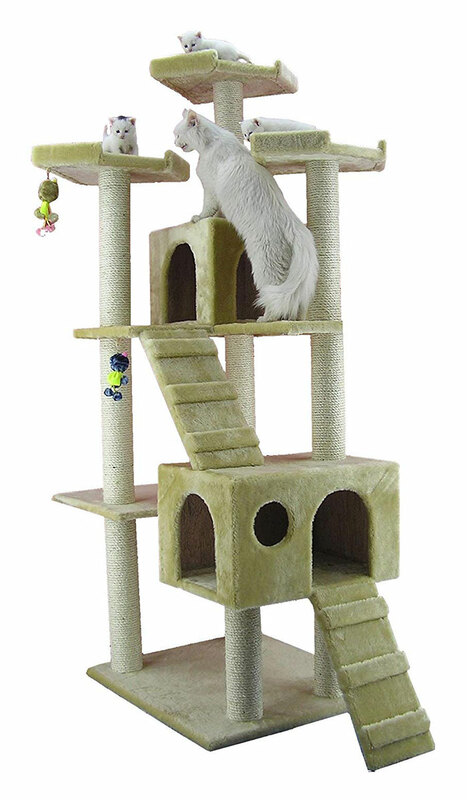 This is a sturdy 74″ tall structure that has ramps, platforms, scratching posts and sleeping boxes. Your cats will love this! This structure will give your cats plenty of options for climbing and exercising, it’s always funny to watch what cats will try to do when they have free reign to play on structures like this! This cat tree/condo is constructed from plywood and faux fur covering (in a beige color). It can be assembled fairly quickly and comes with everything that you need to install it, including the assembly tools and an instruction manual. What are people saying about this cat tree? Overall, people that bought this cat tree are very happy with it. Cat owners that have more than one cat especially rave about this tree, because of it’s size and sturdy nature. Buyers of this cat tree find that the faux fur feels thinner than the carpet found on more expensive cat trees, but it’s softer than carpet and easier to clean. They also say that the faux fur doesn’t really shed like some carpet does, and that their cats love the faux fur just as much as anything else they sleep or play on. This cat tree is very easy to assemble, with no real complaints about assembly and most people saying they were able to unpack and assemble in less than an hour, with some claiming to have assembled it in as little as 20 minutes. How does this cat tree hold up? According to people who have purchased this cat tree, it holds up surprisingly well, even under heavy use. Some people say that they need to tighten some of the bolts every now and then, but overall it hold up to all kinds of cat use and abuse. Many owners of this cat tree are very surprised in the quality of the construction and materials used, they expected this tree to not be very well put together and found out otherwise after delivery. Big cats don’t have any problems with this cat condo either, it sleeping boxes are pretty spacious and people with big cats say that the cats don’t look cramped and can fully enjoy all the aspects of this structure. Another interesting comment is that the scratching posts are plenty tall even for larger cats, allowing them to stretch out as much as they are able to while scratching, as cats like to do. Is it sturdy? People who own this cat condo say that it is surprisingly sturdy, even those that were skeptical before buying. There are many people that say they have big cats that love playing on the top platforms and the structure does not wobbling or sway. Any complaints? The most common complaint is that the small toys that come with this cat tree, which are intended to dangle from a string, are not very strong and tend to fall apart or get removed from the tree by cats fairly easily. But this shouldn’t deter you as this is a very minor, almost unnecessary feature we are talking about here. You can always buy your own cat toys, which are cheap, and dangle them from the platforms if you like. Other than that, there really are no other major complaints, which is pretty impressive. We feel that you can’t go wrong with this cat tree if you need one that is affordable, high quality, and very fun for all types and sizes of cats. Are those stairs removable? As in – do they have to stay on the thing to keep the structure sturdy? From what I can tell, the ramps are not really necessary to keep it sturdy. The way that the platforms, houses and poles are attached provides all of the structural soundness. I like this one a lot, or I suppose I should say my cats do. It wasn’t too hard to put together because I just made my husband do it ahaha so if you have a husband or boyfriend just make them put this together for you like I did. I have this one – very sturdy. No, the ramp/ladders are not necessary to the structure, and the cats really don’t use them for anything. My cats (ages 6 mos. and 1 year / 5 lbs. and 10 lbs. )don’t use the larger bottom box at all, which is surprising to me because it is quite large. They do sleep in the upper box quite often. They both sleep on the top platforms, even though the larger cat hangs over, she doesn’t seem to care. The faux fur is very soft and easy to keep clean. To me, there isn’t much there to sink their claws into, but they don’t seem to mind and climb it very well. They love the rope covered poles and use them often (which saves on my leather furniture!). Because the base is large and square, there is no wobble to this at all, even when they are both on it chasing each other around. I have it in front of a window, but not against a wall or anything for stability, it’s not needed. I’m a woman, and I put this together myself without issue within a 1/2 hour. The instructions were a tad lacking, but not really all that difficult to decipher.